When equipment needs to be relocated, BSC can provide all the services required to get the job done properly. Our trained personnel provide quick, economical and proper shelving installation with all of our industrial equipment relocation services. Don’t trust the relocation of your critical storage systems to a moving company. The dismantling of existing equipment and reinstalling it requires professionally trained personnel to avoid problems and excessive costs. Our team can handle everything from new site assessment and relocation planning to disassembling of your storage shelving and material handling systems. 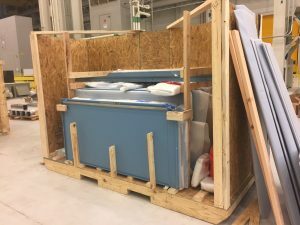 Material storage equipment relocation requires skilled, trained personnel to assure the “move” maintains asset sequence integrity, prevents losses, and maintains security. We pay particular attention to space allocation and shelving installation when placing equipment in the new facility. BSC provides site surveys and analysis before proposing the move pricing. When the time arrives that storage shelving solutions need to be relocated, call on our team of seasoned storage equipment relocation professionals. These BSC relocation services are provided directly by our professionally trained staff. The success of a relocation and “move” is often dependent on the team that plans and executes the project.